Valentines Day came early to our house, in the form of Mascarpone Brownies. They are the most in-demand dessert in my repertoire and I have a feeling that you'll enjoy them too. If these brownies were an item of clothing they would a cashmere shawl; they envelope you with a warm and decadent feeling. Really, they should come with a warning sign... you can't eat just one. Preheat oven to 325F and grease or parchment paper a 8x8 pan. Set aside. Sift flour, salt and cocoa into mixture and stir just until combined, making sure to scrape all sides of the bowl. Pour batter into prepared pan; bake for 40-50 minutes or until tester comes out clean. 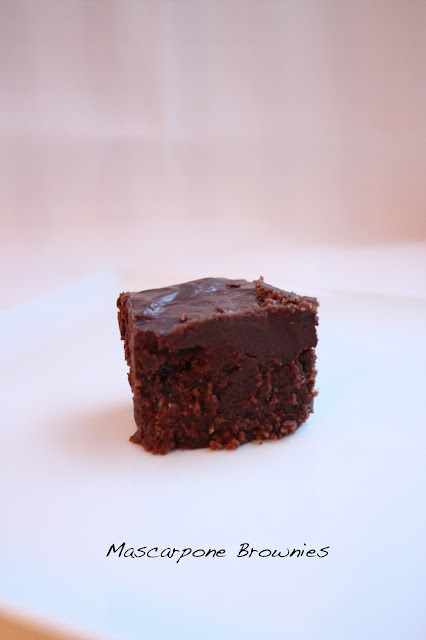 While brownies are cooling, make your ganache to pour over the top (you can do this while the brownies are still warm). Heat butter and cream on medium power (taking care not to boil) in the microwave and add chocolate. Stir until all lumps disappear. Let cool completely, I like to put mine in the fridge until set. These sound incredible -- love anything with mascarpone! These look INSANE!! When I used to live in NY, my friend and I would sample every brownie possible for "THE VERY BEST". I'll have to give these a shot and send her some! They look delicious! I wish I was better at making sweets and cakes because I just love them!